War-date Autograph Document Signed “B.White” 1pp. 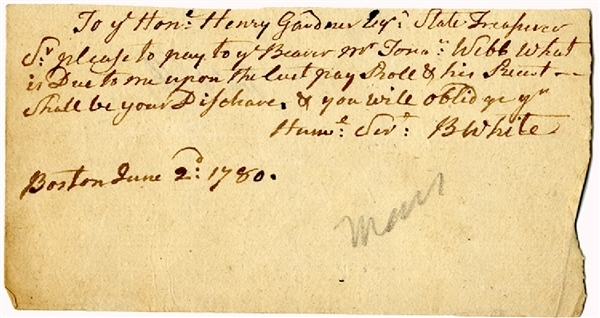 oblong octavo, Boston, Massachusetts, June 2, 1780, asking Henry Gardner, Massachusetts State Treasurer, to pay Jonathan Webb “what is due me upon the last payroll ...”. Fine condition. Jonathan Webb served in Revolutionary War in Captain Nathaniel Webb’s Company, 4th Regiment Connecticut Infantry (Militia); was at Valley Forge.